How much force can a submersible thruster generate? How can you measure it without a full aquatic lab? This page documents experimental testing of the submersible thruster MK-01. 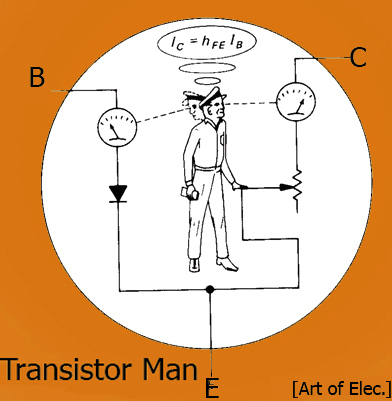 Design and fabrication of the thruster is listed here, take a gander for some details! The ice has receded, and is no longer available for scootering on. The resoviour was ready for some static submersible thruster testing! * Torque and force produced on impulse loading. Initially I had wanted a ballpark force value for the thruster, was it 10 lbs-force? 50? 100? While in simulation it was designed to prevent cavitation at ~2.2k rpm, I needed a boundary to define how the thruster mounted to the canoe-contraption. To do this, in a quick-ballpark fashion, i used some square aluminum tubing, ring clamps and a very basic electronic 'fish' scale. The scale I had on hand was only 50lb rated, so I took advantage of a lever-arm to get more useful range out of the scale. Initially, I had the brilliant plan of testing the thruster towards the end of the winter season. After getting out to the ice and determining that it was too thick to cut with a simple harborfreight single-ended hacksaw, i took some measurements and made sketches of a test rig for the warmer weather. To do this quickly, i took advantage of a handle-ramp area at a local park to use as part of the pivot point for the measurements. Unfortunately during testing my 'swapfest' camera took a plunge in the water, so some photos are from the gopro directly. 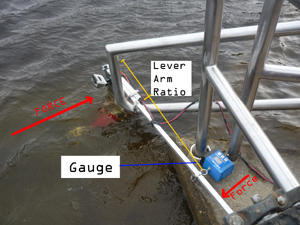 The railing sits approximately 4 inches from the resoviour surface, and at that point the water depth is roughly 1.5 ft. Note on the day of testing, the water temperature was in the mid 30s (F), so standing in it for extended periods of time was unadvisable. I started with the lever-arm, and double-ring clamped the motor assembly to an 8' long 1" square, 1/8th wall aluminum tube. Note the drill in the picture, a hex-head adapter for the drill saved a lot of time zipping the sections of tubing together. For this test, i fabricated a 3phase extension cord from some donated 14 gaguer silicon wire. Note that 14 gague isnt really sufficient for the power requirements, but for pulse loading it helped get the testing completed early. Multistrand silicon wire is also great for these type of test, as its incredibly flexible. 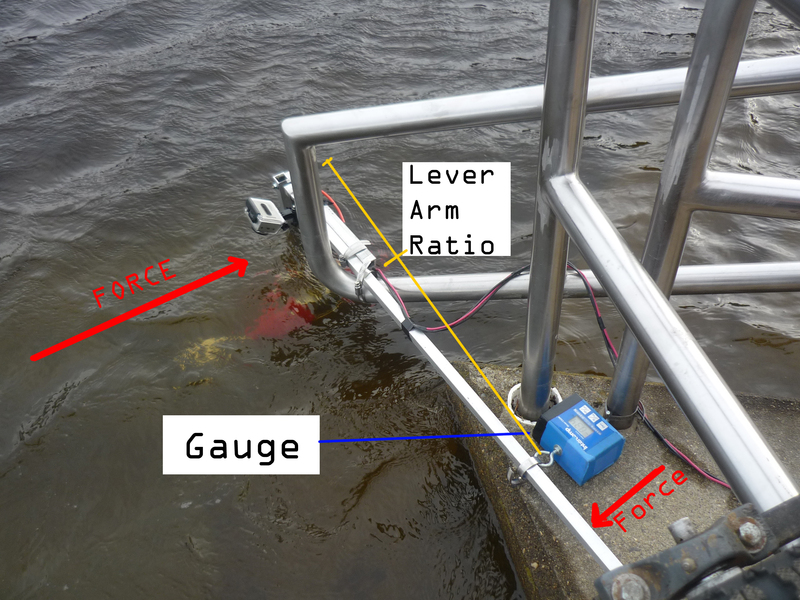 I used a variable lever arm to determine a rough estimate of force generation at different power levels.As the motor pushes forward, it pulls against the lever arm the lever arm itself it sitting between the concrete slab and a small aluminum guide. Static friction in this test setup is fairly hight, however, and the lever arms themselves are not static, and deform under test. The 3phase drive from the electric scooter project was used to power this test rig. To make it easier to operate the motor controller, observe the watt-meter and observe the force gague, I located the scooter on top of the railing assembly. This was a bit precarious, as it was a windy day. A lab notebook (held down by a drill) was used to record force / watt data. Footage was recored using a GOPRO HD Hero (circa 2010). Note that I purchased this item third hand and this was the first test of its functionality underwater. It worked great! Note that the mount was ring clamped and electrical taped in place to prevent it falling into the resovour. Initial testing of Submersible Thruster in freshwater. 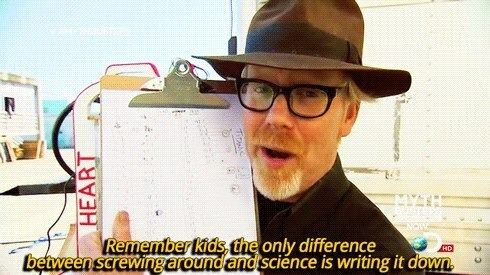 There was a great quote from mythbusters [link] regarding science and lab notebooks, and it does hold true! I recorded rough power vs force measurements during testing, unfortunately this required jotting down data hurriedly while manipulating throttle and keeping one hand on the circuit breaker/off switch. During testing a couple walked by with their dog, and concernedly asked what I was up to, grabbing a lab notebook with data convinced them I wasnt up to anything nefarious. 118 pounds-force is a lot of thrust for a homemade contraption, with a mathematically designed propeller. While i am a bit skeptical on how it was that high (test setup innacuracy, strain gague accuracy) it was visibly twisting aluminum extrusions without much effort. There is a list of 'trolling motor' sizes for various crafts [link] and ~100lbs-force of thrust is sufficient to move a 4000lb vessel, albeit slowly. fancy expensive trolling motors put out roughly half as much thrust [link]. 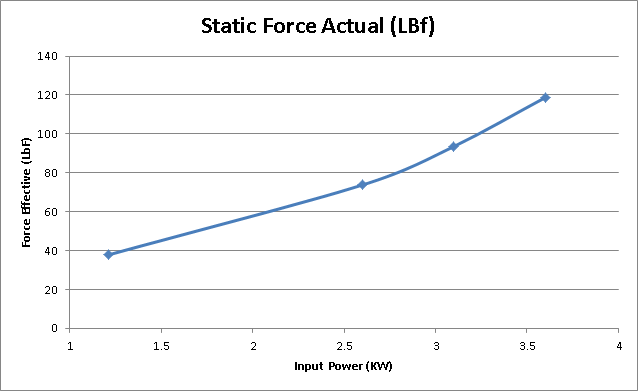 Note that had i continued (with a larger controller) to increase power, the static force should beging to fall off, as the relationship is fairly nonlinear [pdf link]. I was fortunate enough to come across a wayward dinghy. I patched the small leak and it was deemed water-worthy. I quickly threw together a 'carrier' frame using square tubing and two wheelchair wheels. The carrier frame was intended to mate with the electric scooter / bicycle for the purposes of towing the boat around. After the baseline test data was collected i wanted to translate linear force into tangible speed. To do so in the simplest fashion, i took advantage of a holiday weekend and retrofitted an aluminum dinghy for the purpose of speed-testing. A quick pivot arm was fashioned from some spare aluminum square tubing and clamped onto the back of the boat. Ingredients: Boat, thruster, crazy aluminum frame carrier and bike. To test the setup, as the thruster would be below boat level, I lifted the whole contraption up onto a nearby, very large treestump. As shown (far right) the clamp-mechanism was not very structural, however, as this test was for a rough estimate, it was sufficient for testing. Note the boat itself has much more surface contact area with the water than the canoe would, so the speed observed on water was a very conservative estimate of canoe speed. after constructing the boat carrier, I looked around and found a hidden boat ramp entrance. No need for the fancy carrier after all! What a beautiful day! The boat ramp listed rules for the resoviour, the <10hp rule was the only one i was really interested in, and as i was controller limited to ~4kw, I was in the clear. As this was an impromptu test, the scooter itself was used as the testbed for the boat. The setup looked pretty ridiculous, but as most testbeds, it was intended to serve a purpose: Test thruster performance and determine any issues / bugs that pop up. This purpose did not include looking fabulous. Then again, its in the eye of the beholder. After wading out a bit, i fired up the thruster (twisting the scooters throttle lever) . It produced an enormous amount of torque the front lifted and I zipped off at what I can only assume was roughly ~8-12 mph. After approximately 1 minute of runtime, the controller, a turnigy 140A brushless ESC, crackled and exploded. A PLUME of magic-smoke flew all over the lake. I was stuck in the water unfortunately. I used a small oar, made from a food container and a plank to row back. * The motor mount has significantly more thrust than i anticipated, and twisted the steering driver bracket. Some of this thrust is directed into rotating the thruster about the mounting axis. * The motor controller can not handle full power for extended periods of time. * Invest in a proper paddle, or make one, and tie it to the craft. * Build a proper test apparatus, prevent risking the scooter from water immersion. * START THE GOPRO CAMERA BEFORE LAUNCH. Unfortunately I do not have footage of the motor controller failure. Boats have a lot of drag, this was a super-conservative estimate at the speed of the final craft. Testing on water is fairly trecharous, there's quite a bit of excitement to go out on the water and just head off into the distance. Unfortunately in this excited state, I neglected to start recording video using the gopro camera mounted to the craft. The motor mount for dynamic testing was found to be too flexible for proper testing, as it would flex based on motor power output. Finally, the cowling shield for the rear portion of the thruster required epoxy reinforcement as portions of the plastic cracked under dynamic testing. Finally, have a backup plan! Having an oar is very useful for the case where the motor controller fails, catches on fire, or both. I had brought along a very, very last minute oar and, while it worked, it was fairly inefficient.